Every movement your body makes involves muscle contraction and the list of exercises available is endless. 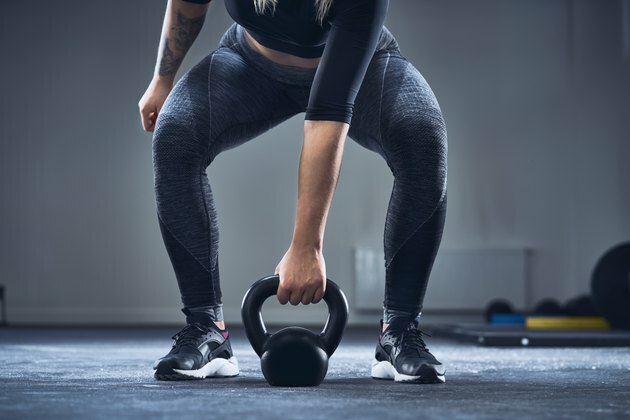 If your goal is to improve performance, understanding the types of muscular contractions, and which exercises utilize those contractions, will improve your muscular strength and performance. Isotonic muscle contraction is the force generated by a muscle while contracting, when the muscle lengthens and shortens during movement. The amount of force typically remains constant during this type of contraction. Therefore, when you pick up a glass to take a drink, your muscles would use the same force throughout the movement up and down, which is nearly impossible. During normal muscle contraction the force varies throughout the movement. A more accurate term is dynamic contraction, meaning the muscle tension varies as it moves the glass. Isotonic muscle contraction can be further divided into two types: concentric and eccentric. During concentric movement, a muscle gets shorter as it contracts. For example, the biceps muscle shortens as you bend your elbow during a bicep curl. Eccentric muscle contraction means that a muscle is getting longer while it is contracting. This movement typically occurs when an object or your body is being lowered down to the ground, with the pull of gravity. Because gravity is pulling on you, your muscles must fight to control the speed of movement. For example, during the lowering phase of a bicep curl, your biceps muscle is still contracting, but is getting longer as you return to the starting position to keep your elbow from straightening too quickly. If you push against something that is immovable you are experiencing isometric contractions. This may also be called static tension. Isometric exercise involves muscle contraction without the muscle or joints moving. Examples of isometric exercise would be pushing against a wall or doing a push-up and stopping in the "up" position. Isometric exercises do not significantly build strength but they can maintain strength, which is why they are sometimes used in a rehabilitative setting. For example, if someone suffers from arthritis and it is painful to perform range of motion exercises, isometric exercises may help maintain strength in the surrounding muscles without causing more pain. In these cases, isometrics are performed with sub-maximal effort. If you have a heart condition, talk with your doctor before performing isometric exercises. These movements often trigger a person to hold their breath, which can be particularly unsafe for people with heart conditions, according to the University of Wisconsin. Isokinetic exercises are also most commonly used in therapeutic settings. Using a dynamometer to control the contraction, isokinetic exercise helps build strength in stroke victims or people who have limited used of their muscles. An isokinetic contraction is a dynamic contraction but the speed of the entire movement is controlled by the machine. This control prevents injury and also measures areas of strength and weakness in muscles. Any exercise involving the contraction of muscles can be isokinetic if the dynamometer is being used.